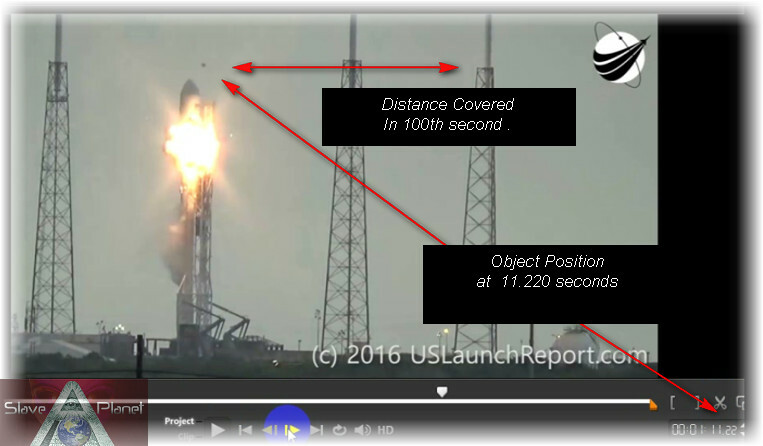 So we watched the movie, we saw the explosion, they say accidental, many say the object whizzing by was a bird, many others say UFO, If it was a bird one thing for sure, it is a pretty fast one, maybe a new breed ? �So we took the task of seeing if anything stands out to show and solve this puzzle. 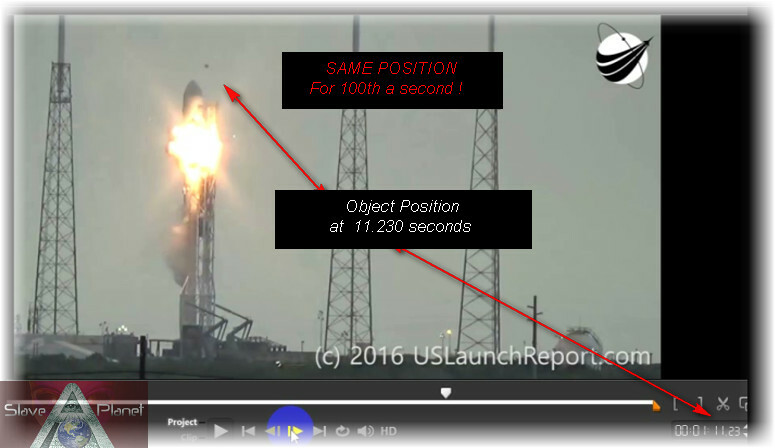 In the video below we cover it and below the video, we show the strange anomaly of the missing 100�s of a second, as you will see from the pics, with each 100th of a second click, all is fine until the object gets near the Rocket, then it slows maybe even stops for a milli second ? who knows for sure ? But one thing is certain ,its way to fast for a normal bird, and time of flight WAS altered. 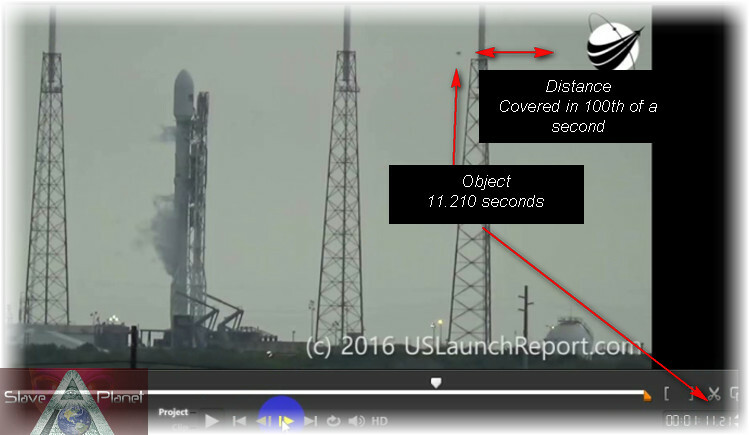 Follow the Timeline, each snapshot was 100th a second, all is well until approach to SpaceX Rocket, then for 200ths it appears stationary. 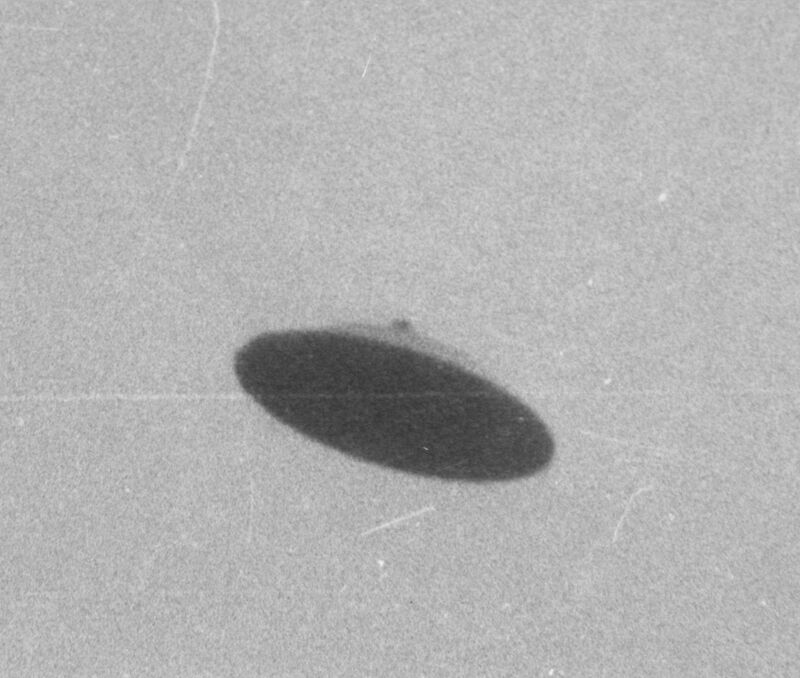 In the video, we show how a bird takes some 5 seconds to clear screen, whilst this UFO Object, only needed 800ths a second ? 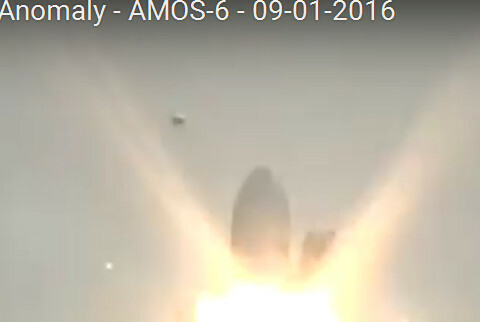 �So its either a rocket engined Bird or a flying object commonly we call a UFO, Question is who�s is the UFO ? �Alien or Elites latest weapon ? �The plot thickens during these people enslavement times.. REGARDING SPEED !! 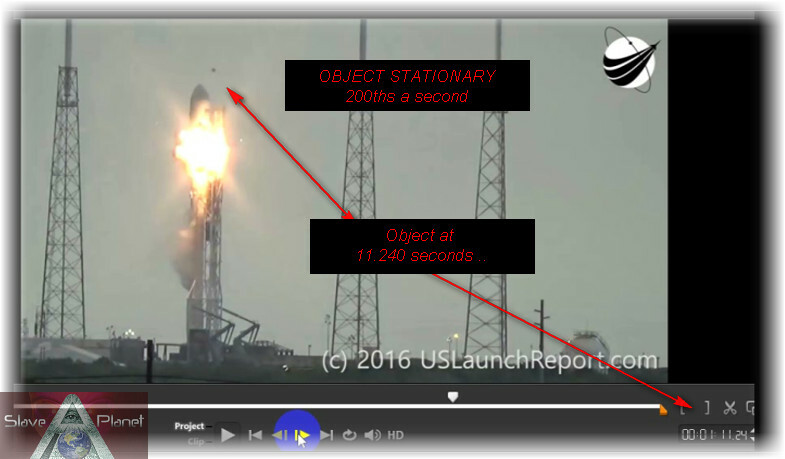 THANKS TO A VIDEO VIEWER�"Rocket 60Saturn" A�Estimated Speed of the object comes out at �1,480 miles per hour . �HERE Is the way he got to that estimated figure. "I did a back of the envelope calculation. Went to Google Earth and looked at the 3D of Launch complex 40 where this occurred. The object enters just to the right of and above the Lox storage tank. 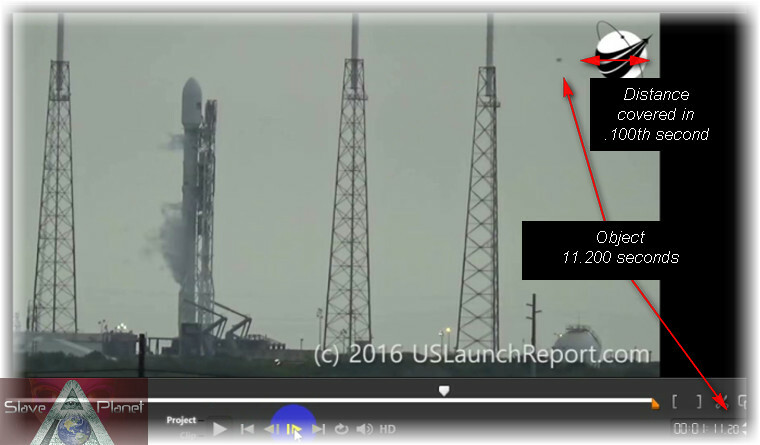 In looking closely at the original video, it definitely flew behind the three observable lightning towers (especially notable at the third lightning tower at the left). 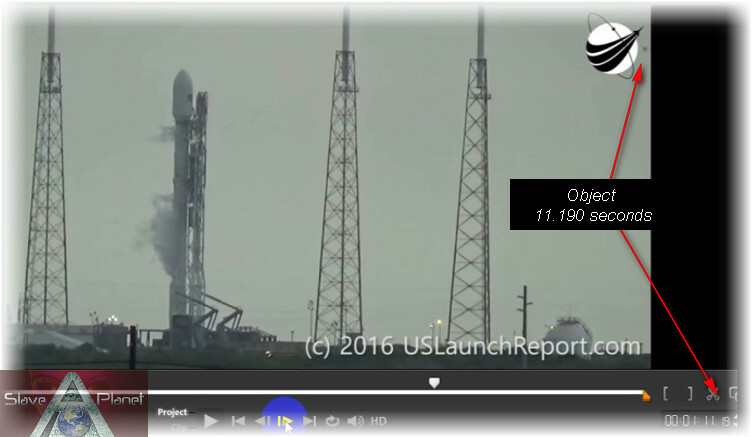 By my calculation, from where it entered at the right side of the screen above the Lox tank to the time it can be seen just behind the third tower to the left takes approximately 23/100's of a second. If you use the Google Earth ruler tool and place it directly above the Lox tank and measure to the end of the third lightning tower, you get approximately 500 feet. Sooo. 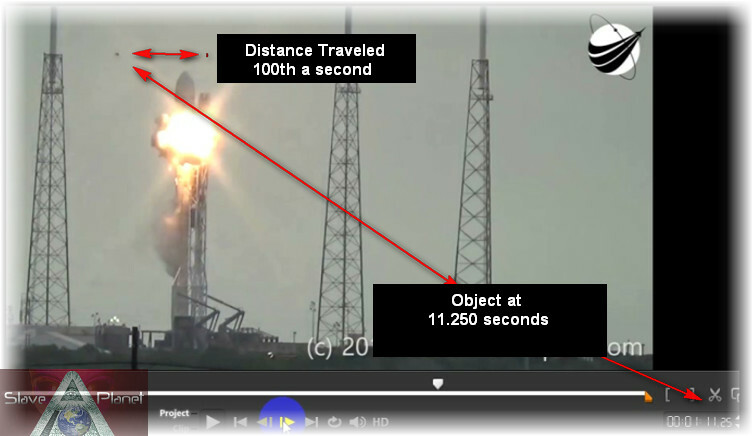 using simple math 23/100 of a second (the time it took to travel 500 feet) is to one second, as 500 feet is to 2,174 feet. 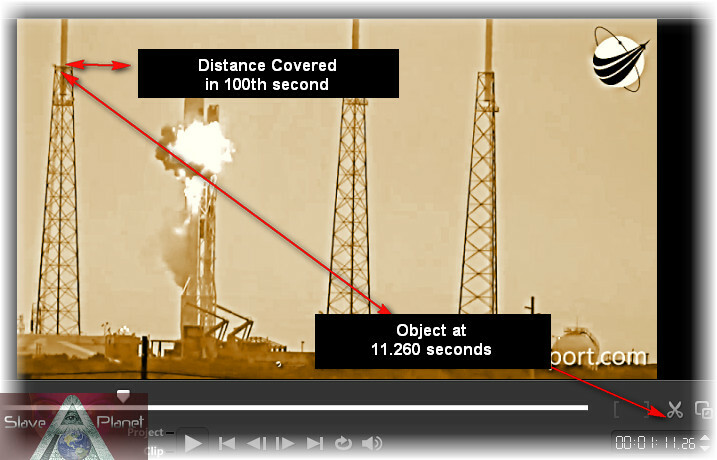 Then, one second is to 2,174 feet of distance as 60 seconds is to 130,400 feet of distance. And, 60 seconds, or one minute is to 130,400 feet as one hour is to 7,826,000 feet. So, that is the distance in feet it would travel in an hour Now, there is 5,280 feet in a mile. Dividing 7,826,000 by 5,280 renders an approximate supersonic speed of 1,480 miles per hour, give or take a few. Folks, that was no birdy. Once it leaves the left side, it then comes back in and leaves the area almost as fast as it came. Crazy! "